I have a dilemma. Or I HAD a dilemma. A front entrance dilemma. You've seen many of my before and afters in our 1930's cottage. We've been here a little over a year now and are working our way through room by room. Still have the basement bathroom (you will LOVE the befores - the craziest mix of a 1970's light fixture, faux terra cotta tiles finished up with non-slip DUCK stickers in the tub with a touch of a 1980's cottage style mirror (remember crackle?) - the only things missing are some pot pourri and a bit of sponge painting. That project is coming along. Soon, I tell you! But what I NEEDED to address right.away was the front entrance. The cottage was tiny in its original form - miniature rooms - and the previous owners had opened up the main floor bedroom and old living room to be one larger open space. I can't say "big" because it's still pretty compact. But it WAS the right move. Problem - the front door opens up right into the living room. Problem - no storage at the door for shoes. Problem - nowhere to sit to put on shoes. Problem - no landing strip for keys or mail. Problem - did I tell you that it RAINS here most of the year? Think rain boots and umbrellas and dripping raincoats. But I can ALWAYS find a solution. Might not be the PERFECT solution but it'll be the perfect one for the situation at hand. Ready? Here we go. First I better give you a look so you can see what I was working with. And now for my solutions - you can SO use these in any small space. 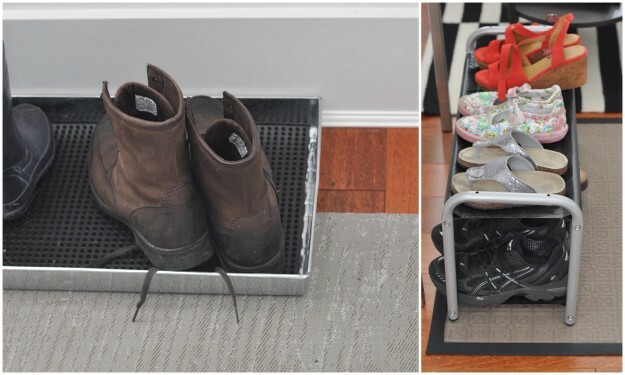 On the left I have a galvanized boot tray from Crate & Barrel. I have THREE of these - one at each door. Can you see the rubber insert? Genius. And on the right is the Lustifik shoe rack from IKEA. We're all about the high/low over here. I don't care how much or how little it costs, I want it to work! I needed a VERY thin floor mat as the previous owners made a renovating boo boo - they DIDN'T go down to the subfloor when installing the new hardwood so the front door barely clears the floor when it opens. Tut tut tut - doesn't pay to cut corners! The only one thin enough was a Chilewich. I DID splurge on a bench from Style Garage. It's sitting on two jute rugs from Pottery Barn. And it's not in the photo but I have a basket underneath the bench where the girl stashes her many, many, MANY different flip flops. (6 year olds and flip flops - a match made in heaven). This DOES solve the opening-right-into-the-front-room problem by creating a separation between this area and the couch. It gives the illusion of an entrance. I needed somewhere to drop the keys and the mail when I walked in but it had to be a particular width and quite shallow. Again I went to Style Garage and had them make a custom size of this table. It has two legs in front and attaches to the wall. Since I'm back on the west coast with it's HUGE Asian influences, I'd be remiss if I ignored feng shui. The narrow stairs to the second floor are directly in line with the front door on the other side of the living room. Not good - any good luck in the house runs down the stairs and out the front door. I don't REALLY believe it but just in case, I found a solution. Hung a crystal above the door. Any good luck running down the stairs will be reflected BACK into the house. What didn't I do? I still need to find a tiny mirror to put above the landing strip and to the right of the alarm panel. I can't fit anything larger than maybe 12" square. I also thought about an umbrella stand but instead I leave them outside the front door. There just wasn't any room. And that's it. I think I've solved my front entrance dilemma. How about you? Do you have any entrance dilemmas in your small spaces? How did you solve them?